Reel Asian is a registered not-for-profit. It is a charitable cultural organization that champions the future of diverse storytelling in Canada by advocating for Asian representation in the media arts. Students and seniors can enjoy a 20% discount on any membership. 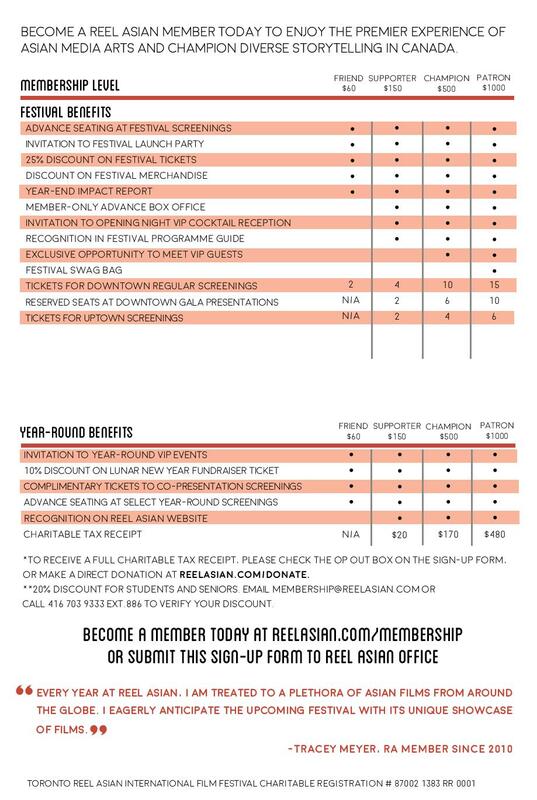 For receive your discount, please contact membership@reelasian.com before you sign up. For members who sign up BEFORE the Centrepiece Presentation at the 2017 festival, their membership is valid until October 1, 2018. For members who sign up ON THE DAY OF OR AFTER the Centrepiece Presentation at the 2017 festival, their membership is valid until December 31, 2018. 25% ticket discount only applies to downtown festival screenings. 20% discount for screenings at the Japanese Canadian Cultural Centre. THANK YOU TO OUR REEL ASIAN MEMBERS!